When I was little, my dad would often take me around the backyard to hunt for bugs. Spiders—which are not bugs, but little me didn’t care about taxonomy at the time—were my favorite. Upon discovery, I could have spent hours watching arthropods just do their arthropod things. Each hunt was its own exciting adventure. What would I find today? Where would the best spiders be? The best caterpillars? Should I check plants or should I try looking under rocks? 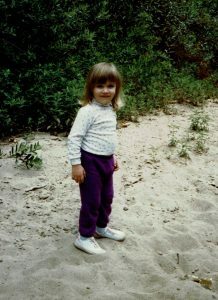 Four year-old me didn’t know she was laying the foundation for a future in science, but my bug-hunting days would end up shaping my interests in both expected and unexpected ways. In undergrad, I thought I was going to be an entomology major and study bugs—or rather, insects, as I eventually learned the distinction between the types of arthropods—forever. Well, instead of entomology, I ultimately got a PhD in microbiology. My dissertation research was on bacteriophages, or phage, which are viruses that infect bacteria. These weren’t the bugs my younger self had in mind, but phage tail fibers sort of look like spider legs, so…close enough? I recently joined Kristin Parent’s lab at MSU as a BEACON postdoc. We’re both phage enthusiasts, and one day we were lamenting the dearth of phages that infect Shigella flexneri, the bacterial species our lab works with. We decided to remedy this. Could we find more Shigella phages by hunting for them in the environment? “Phage hunting” has recently gained a significant following, with multiple universities contributing to phage discovery projects. The biggest of these is the Science Education Alliance-Phage Hunters Advancing Genomics and Evolutionary Science (SEA-PHAGES) program, which is an alliance of over a hundred universities. Each university has a two-semester phage hunting program, where undergraduate students isolate and characterize bacteriophages they find in the environment. While Michigan State University is not (yet?) a member of this alliance, we wanted to give phage hunting a try. Besides, with an estimated 1031 phage particles in the world, we’re only beginning to scratch the surface of bacteriophage diversity. The more phage we find, the merrier! 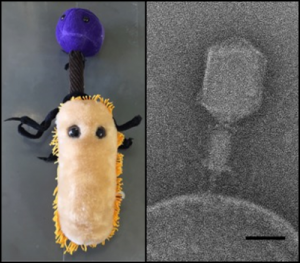 Bacteriophage infecting a bacterium: our lab’s interpretation with Giant Microbes (left); under an electron microscope (right). Scale bar is 50nm. Every fall, Dr. Parent teaches a section in the graduate course Integrative Microbial Biology (MMG801) here at MSU. While SEA-PHAGES focuses on undergraduate courses, we wanted to start on a very small scale to test our methods and gauge students’ responses before scaling up. The SEA-PHAGES program also spans two semesters, whereas our section would last just a few weeks. We asked groups of 2-3 students each to dig into the literature, develop hypotheses about where they were most likely to find phage, and come up with some possible methods to isolate them. They would be screening their samples on three types of Enterobacteria: Salmonella enterica, Escherichia coli, and Shigella flexneri. A lot of those bacteria are found in the gut (hence the entero in Enterobacteria), which means they can also be found in poop. Because of this, most groups went for locations that were…less than sanitary. One group grabbed river sediment near a wastewater treatment plant, two groups took water from the Red Cedar River where it flows through campus, a couple groups went to locations where they thought they would find livestock or waterfowl manure, one group scraped some biofilm off a water buoy in the river, and one group decided to swab an apple from the student union. Upon retrieving their chosen material, the groups then processed their samples in our lab. The students put some of their sample on agar plates or in liquid cultures of bacteria. The next day we checked the plates for the formation of plaques, which are small clearings where phage have killed all the bacterial cells in the region. We also checked the liquid cultures to see which ones had cleared: another indication of bacterial death. 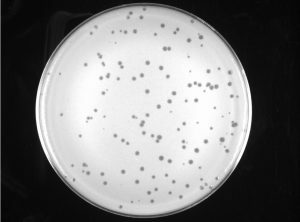 An agar plate with bacteria (white/opaque portion) and plaques (small dark circles). This is phage Jawnski from the University of Pittsburgh. Sarah often sees plaques like this when she closes her eyes after a long day in the lab. We kept the students updated with our findings while we characterized their phages. We sent them pictures of their phage under the electron microscope. We tested the phages’ host ranges and sequenced their genomes, which we’re still in the process of analyzing. We see some unique properties of these Shigella phages, and we hope to submit a paper on our findings this summer. At the end of the semester, students’ reviews were very positive: “very interesting lecture and cool project!” and “I REALLY loved the fact that the homework assignment was hands-on field and benchwork.” There was only one criticism: they wish it had lasted longer! Now we’re working to get similar modules into undergraduate courses here at MSU and in other schools. Phage hunting can be fun for everyone, and hopefully the thrill of discovery can get more students interested in science. So although this isn’t the kind of hunting my younger self ever would have thought about, I think she’s okay with it. The experience of getting your hands dirty, wondering whether to check under rocks (or buoys! ), thinking about what you might find where…these are all the ingredients of science. As long as there are new phages to be uncovered and new questions to be asked and answered, the hunt will continue. Hendrix R.W. et al. (1999) Evolutionary relationships among diverse bacteriophages and prophages: all the world’s a phage. Proc. Nat. Acad. Sci. USA 96:2192-2197. Grinell, Frederick. The Scientific Attitude. New York: Guilford Publ. 1992. Print. This entry was posted in BEACON Researchers at Work, Education and tagged BEACON Researchers at Work, Biological Evolution, Education, Field Biology, m, microbiology, Research Experiences for Undergraduates, Viruses. Bookmark the permalink.